It’s been my lifelong dream to open an orphanage for needy children. Since that seems to be an impossible goal here in restrictive America, I have found other ways to help. My husband and I have hosted many medically needy children from around the world. We have adopted our own two daughters from India. I’ve also volunteered, for nearly thirty years, in ministries that reach out to kids here in my own home town. But now it seem that my “impossible” dream may not be so anymore, as tens of thousands of needy children are currently flooding our nation from Central America. 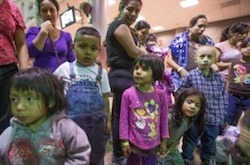 These unaccompanied minors are practically “orphaned” and desperate for homes and families! The US government is now asking for “babysitters”…to care for the youngest of these illegal immigrants, whose number is projected to rise to 100,000 before the end of this year! I believe that I will look into this babysitting gig. I’ve heard that God works in mysterious ways! This entry was posted in Uncategorized and tagged Amnesty, Dream Act, illegal immigration. Bookmark the permalink.